Place chicken in slow cooker and top with Buffalo wing sauce. Remove chicken from slow cooker and shred using two forks. 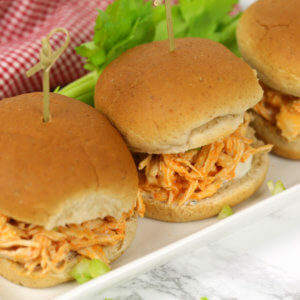 Place shredded chicken in a large bowl and add 1 cup of Buffalo wing sauce from slow cooker. Stir in blue cheese dressing. Place chicken mixture onto slider rolls and top with chopped celery.